Jamie Bristow-Diamond grabbed a hat-trick as Bexhill seconds fought out an amazing tied game at The Polegrove on Saturday. Byron Smith later grabbed the final Horsham wicket as both sides were bowled out for 138 and picked up 15 Sussex Cricket League 2nd XI Division One points. Bexhill won the toss and decided to bat on a slightly green Polegrove wicket in their first home league game of the season. This decision quickly backfired as Bexhill lost a wicket to the first ball and were 1-2 a couple of overs later. With his side in real trouble, skipper Neil Blatchly took the game to the bowlers with some positive strokeplay. Wickets continued to fall around him, however, as many of Bexhill’s middle order fell to some controlled bowling. 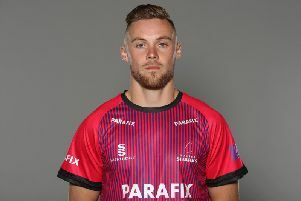 Blatchly eventually departed for a crucial 59 from 67 balls with the score 83-6 and Bexhill were considering the possibility of being bowled out before the mid-innings drinks break for less than 100. Wicketkeeper/batsman Ryan Darvill had other ideas, though, as he showed real patience and resistance to ensure Bexhill at least used up a decent proportion of their allocation. Darvill was eventually the last batsman to fall for 28 off 78 balls. Horsham got off to a great start in reply, but as they reached 30-0, the game took a serious twist. Blatchly (3-41) decided to bring himself on to bowl and removed two batsmen in one over, while Bristow-Diamond (4-55) took a hat-trick with some fast, full and straight deliveries. He nearly had a fourth in a row as an lbw decision was rendered moot due to the delivery being a no ball. This left Horsham floundering at 36-6, which later became 60-7 and 80-8. Tom Clark (28) and number 10 Jonathan Whiting (38) moved the score on to 132-8 until Clark was dismissed behind his legs by returning opener Smith (2-10). Horsham’s number 11 struck a four to tie the scores only to then be bowled by Smith as honours finished even.